Yesterday, legislation authored by Assemblymember Timothy S. Grayson (D-Concord) to help victims of domestic violence and human trafficking was signed into law by Governor Edmund G. Brown, Jr. The nonprofit Family Justice Center, a one-stop support network for victims of domestic violence, sexual assault, human trafficking and child or elder abuse victims, plans to open an Antioch location in early 2019. The Justice Department’s Office on Violence Against Women has awarded $32 million to improve the criminal justice response to sexual assault, domestic violence, dating violence, and stalking. Among the 54 nationally awarded grants, the Contra Costa EHSD received nearly $1 million. EHSD will use this funding over the next three years to strengthen critical victim services, judicial handling and law enforcement response, as well as to deepen its cross-sector community partnerships throughout the county. To read the full article, click Alliance Grant Press Release. 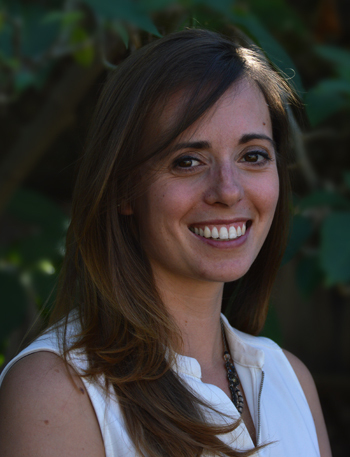 Congratulations to one of our very own Lawyers for Family Justice! Those who dine at Salute E Vita Ristorante in Richmond on Thursday will help raise funds for the West Contra Costa Family Justice Center. In honor of International Women’s Day, Salute owner Menbere Aklilu is donating 15-percent of all restaurant sales on Thursday to the Family Justice Center, a one-stop shop of services and resources at 24th Street in Richmond for abused women and their families. Last year, The Family Justice Center served over 1,000 families and launched an elder abuse prevention program. 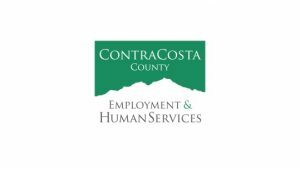 “The Contra Costa Family Justice Center is an invaluable one-stop center for families affected by domestic violence, sexual assault, elder abuse, child abuse, and human trafficking. In 2017, the Family Justice Center served 2,440 survivors of interpersonal violence. Over 80% of Family Justice Center clients have at least one pressing legal need. The Family Justice Center Alliance, a program of Alliance for HOPE International, proudly highlighted it’s 17 AFFILIATED Family Justice Centers and Multi-Agency Centers in the United States. The Contra Costa Family Justice Center’s Community Fellowship Program was included in their recognition! 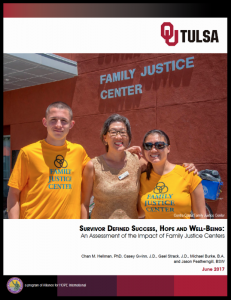 Earlier this year, the Contra Costa Family Justice Center participated in an evaluation report of seven California based Family Justice Centers released by the University of Oklahoma. The Center of Applied Research on Nonprofit Organizations research team worked closely with Alliance for HOPE International and its Family Justice Center Alliance program to complete the research study. 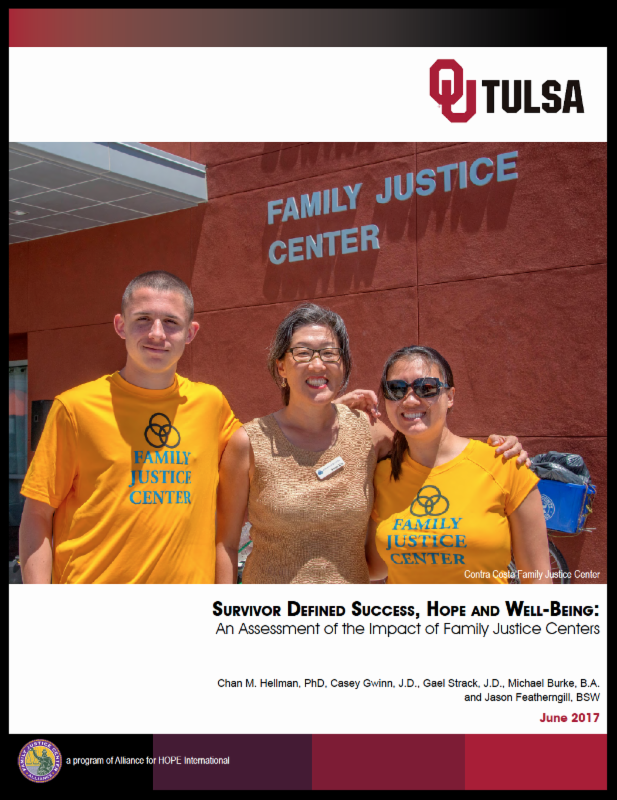 “Survivor Defined Success, Hope and Well-Being: An Assessment of the Impact of Family Justice Centers” found statistically significant increases in Hope, Resiliency, Satisfaction of Life, Emotional Well-Being, and Flourishing in the lives of survivors after receiving services in Family Justice Centers in California. The study was funded by Blue Shield of California Foundation as part of their long-term support for the development of Family Justice Centers in communities across California. Contra Costa Family Justice Center named an honoree For California Nonprofits Day! 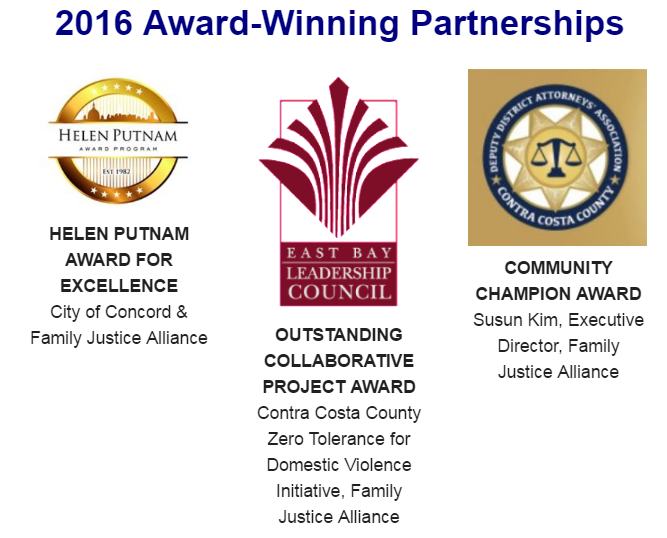 Susun Kim, Executive Director of the Contra Costa Family Justice Center, was honored as the Contra Costa County Prosecutor’s Association Champion for Justice of 2016!